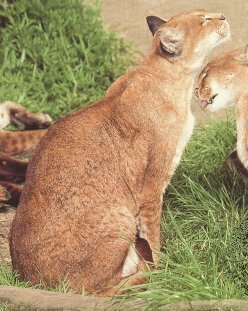 The African golden cat is about twice the size of a large domestic cat and robustly built, weighing as much as 16 kg (26 lb). Its fur varies from marmalade orange-red to sepia-gray, and each color phase may be spotted all over, unspotted, or somewhere in between. The throat, chest, and undersides are invariably white or whitish, and the belly is marked with bold dark spots or blotches. Its tail may be distinctly banded, unbanded, or anything in between. 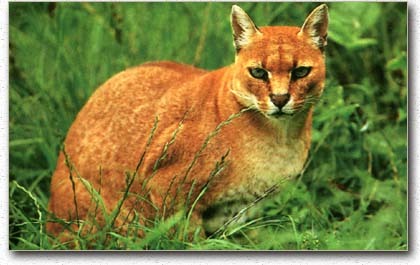 The primary habitat of the African golden cat is in the moist forest zone of Equatorial Africa. It is able to live in many types of forest, including primary forest, secondary vegetation, and riverine forest where watercourses penetrate more open habitat. It is known from montane forest, alpine moorland, and bamboo forest at elevations up to 3000 m (10,000'). The African golden cat apparently adapts well to logged areas with a dense understory, probably because destruction of the canopy favors the dense secondary undergrowth with which this cat is often associated. The African golden cat is an opportunistic hunter, taking small mammals (mainly rodents), but also larger prey such as duikers and livestock (sheep and goats). Although it has been suggested that the African golden cat is arboreal, its stocky build and rather short tail, combined with its presence in alpine moorland, would suggest that it is primarily a terrestrial hunter. There are several observations of the African golden cat hunting during the daytime, but based on the activity patterns of its reported prey, it is likely to be primarily crepuscular and nocturnal. The African golden cat is solitary. The primary population is found in central Africa, in the forests of The Democratic Republic of the Congo basin and surrounding areas. It also occurs in West Africa, in the forests of Senegal to Benin, with an apparent gap in Nigeria separating this population from the central African population. Savannization and deforestation in West Africa have probably led to fragmentation and declines in populations of the African golden cat. The bush meat trade is depleting populations of small antelope prey, which may lead to increased livestock depredation by the African golden cat and its consequent persecution. There appears to be little hunting of this cat. The African golden cat’s total effective population size is estimated at below 10,000 mature breeding individuals (IUCN 2005) . Savannization and deforestation in West Africa have probably led to fragmentation and declines in populations of the African golden cat, unless migration is possible along riverine corridors. The bush meat trade, which is a significant component of the region’s economy, is depleting populations of small antelope prey, which may lead to increased incidence of livestock depredation by the African golden cat and consequent persecution of the cat. There appears to be little hunting of this cat. (IUCN 2005) The fact that the African golden cat does well in secondary forest, combined with its ability to survive on small rodents, suggests that it is in less danger of extinction than many other small cats (Sunquist & Sunquist 2002) . The African golden cat is found in both the Eastern Afromontane and Guinean Forests of West Africa Biodiversity Hotspots (Cons. Intl. 2005) and the Guinean Moist Forests Global 200 Ecoregion (Olson & Dinerstein 1998, Olson & Dinerstein 1999). Seventy-five days (n = 2) (captivity) (Sunquist & Sunquist 2002) . A pregnant female was taken in Uganda in September (Nowak 1999) . Two litters of two kittens each were born in captivity (Sunquist & Sunquist 2002) . Just over 12 years (captivity) (Sunquist & Sunquist 2002) . The African golden cat is an opportunistic hunter, taking small mammals (e.g. groove-toothed rats, swamp rats, water rats, cane rats, and hyraxes), mainly rodents, but also larger prey such as duikers and livestock (sheep and goats), as well as birds and fish (Boy 2003, IUCN 2005) . The African golden cat seems to have no aversion to water, and it will hunt among reed beds in swampy habitats ( Boy 2003 ). The African golden cat is solitary (Sunquist & Sunquist 2002) .